Recent years have witnessed a renewed interest in the sacramental theology of John Calvin. A number of studies have been published, but unfortunately until now it has been difficult for many interested readers to find access to many of the relevant writings of Calvin on the subject. His commentaries and his Institutes of the Christian Religion have long remained in print, but many other important tracts and treatises have remained buried in long out of print and obscure volumes. With the re-publication of Treatises on the Sacraments, this problem has been resolved to a large degree. This volume is a collection of some of John Calvin’s most important writings on the subject of the sacraments in general and the Lord’s Supper in particular. The works are translated and introduced by Henry Beveridge, a well-known Calvin scholar. The first tract included in this volume is the Catechism of the Church of Geneva, first published in French in 1536. It is roughly divided into five major sections: Faith, the Law, Prayer, the Word of God, and the Sacraments. The section on Faith includes an exposition of the Apostles Creed. The section on the Law discusses the Ten Commandments while the section on Prayer includes a helpful explanation of the Lord’s Prayer. The authority of Scripture is explained in the section on the Word of God, and the section on the Sacraments explains the nature and purpose of Baptism and the Lord’s Supper. Following the Catechism of the Church of Geneva are Calvin’s forms for prayer, the administration of the sacraments, the celebration of marriage, and the visitation of the sick. These documents provide an invaluable glimpse into the liturgical life of the church Calvin shepherded. The next two documents included in this volume are a brief personal confession of faith followed by the Confession of Faith of the Reformed Churches of France. Each of the remaining documents in this volume addresses the doctrine of the Lord’s Supper from varying perspectives. Calvin’s Short Treatise on the Lord’s Supper is one of the most helpful summaries of his view to be found in any of his writings. 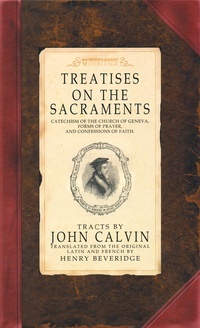 The document entitled Mutual Consent in Regard to the Sacraments was written in the context of Calvin’s discussions with the churches of Zurich. The Second Defense of the Pious and Orthodox Faith Concerning the Sacraments; the Last Admonition of John Calvin to Joachim Westphal; and The Clear Explanation of Sound Doctrine Concerning the True Partaking of the Flesh and Blood of Christ in the Holy Supper were all written in the context of heated debate and controversy with certain Lutheran writers. These writings are helpful primarily because in them, Calvin clears up a number of misunderstandings regarding his views. In the final treatise, Calvin outlines what he believes to be the Best Method of Obtaining Concord on the doctrine of the Sacraments. While secondary sources are usually helpful, there is no substitute for going to the sources themselves. For English readers interested in the sacramental theology of John Calvin, this volume provides a most beneficial resource.